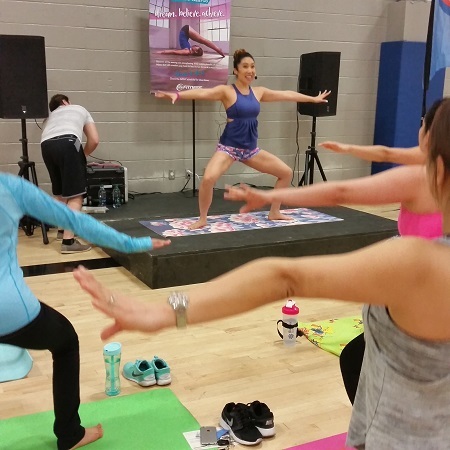 On a recent Saturday morning, I joined hundreds of other workout enthusiasts inside the 24 Hour Fitness Summerlin studio in Las Vegas to take a newly launched POP Pilates class with Cassey Ho. I must say, it was shocking to see so many queue up and wait so patiently, just to be taught by Cassey herself. Well, I soon realized that I’ve been living under a yoga mat, because until that day, I was not familiar with Cassey Ho and her “POP army” of devoted POPsters! Cassey also created POP Pilates – an intense mat-based Pilates workout set to Top 40 hit songs – while a former instructor for 24 Hour Fitness. Now, she has partnered with the fitness chain to make her POP Pilates the official Pilates format for all their gyms throughout the U.S.
Cassey was all set to practice medicine, having earned a degree in Biology, but her passion was always fitness and fashion design. She endured dead-end jobs, and parents who thought she might be wasting her time on “fitness,” but she kept going. It wasn’t until 2009 when she posted a workout video on YouTube – meant for only 40 of her students to see – that she realized her destiny. That one video gave way to thousands, and since then, she has written a best-seller, Cassie Ho’s Hot Body Year Round, and become a full-fledged entrepreneur by designing her own line of activewear and products. At the end of class, I realized why she has millions of followers. She is infectious, motivating and is truly passionate about helping everyone follow their dreams. I now know what I’ve been missing!! I also was a little sore…but it was a good sore! Now that I’m officially a member of the POP army, I got the chance to – first, catch my breath – and then ask Cassey what motivates her, how she found fitness fame and what one exercise she hates to do. EYE: Before and during college, did you have a plan for your future? 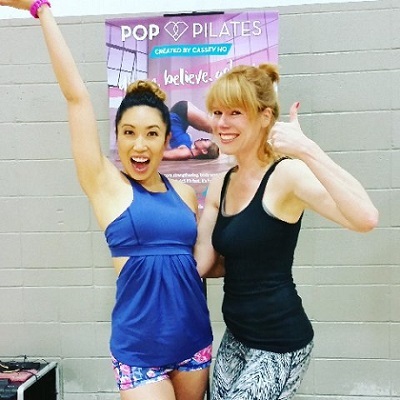 Did you envision the “Blogilates” and “POP Pilates” success that you have today? CASSEY: I always knew I didn’t want to pursue my parents’ dreams of my becoming a lawyer or a doctor. My dream was to become a fashion designer. But that wasn’t acceptable, so I went to college to study biology. My heart was missing. I honestly didn’t know what I was going to do or what my plan was, but I just knew I had to follow my passion for Pilates and design. I never envisioned Blogilates turning out the way it is today. I just took a lot of scary risks, worked extremely hard and followed my heart. Today I’m able to share my passion with millions of people all over the world. EYE: What sets you apart from other fitness instructors? Did social media play a role? CASSEY: I’m not your average fitness instructor. I’m not here just to tell you how to get in shape. I’m here to inspire you to live the life of your dreams while loving your body throughout the process. Social media plays a huge role. Without YouTube, this never would have started. It’s how I communicate and stay close with my POPsters. It’s how I’m able to give free workouts to the world! EYE: You have become a successful entrepreneur with your original Yoga bag line and Blogilates Designs. Did it come easily to you or did you learn as you go? What one piece of advice do you give to other young women who want to become their own boss? CASSEY: Being an entrepreneur is a lifelong journey. But the most important thing I’ve learned is that you don’t need a lot of money, a degree, or a whole team of people working for you. As long as you have an idea that you’re passionate about, then you can make it happen. EYE: What impact have you made on your fans and followers? Is that what motivates you? CASSEY: I’ve helped people not only transform their bodies, but also transform their lives and inspired millions to follow their dreams. It’s 100% what motivates me to continue doing what I do and provide the best for my followers. EYE: You’ve written openly on social media about your own body image, being bullied and “chubby” as a child, striving for perfection, and developing an eating disorder. Why do you think you fell victim to that mindset? What feedback have you received from talking about something so personal? CASSEY: I think my eating disorder and unhealthy obsession with exercise was partly caused by my ambition to work hard and achieve big. When I do something, I want to do it 100% and give it my all. I was far too obsessed with eating clean and my weight, that it became really unhealthy. The feedback I received was amazing. At first, I really didn’t know how people would react, but everyone was so supportive and they even shared their own personal struggles with eating disorders. EYE: What one thing has surprised you most about yourself? CASSEY: Hmm, I don’t know if I really surprise myself very much, because everything I strive for comes from hard work, dedication, and a good heart. But I can tell you that the people I meet along the way surprise me. Let’s just say that as the business grows, it becomes harder and harder to trust people’s intentions and sometimes I have to learn the hard way. EYE: What is your personal message? How has it evolved? CASSEY: To find what you’re passionate about and use that to help people. EYE: What is your proudest moment? Do you feel like you are making a difference? CASSEY: The moment I found out that POP Pilates was becoming a group fitness format at 24 Hour Fitness, my life changed. 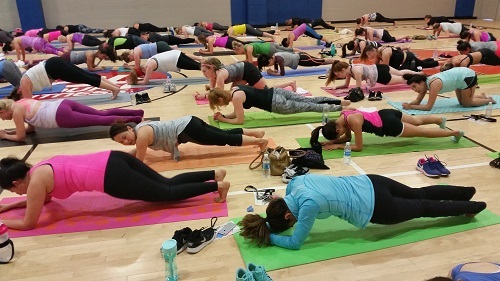 I never imagined that my twist on Pilates would turn into a class that people can go and take! And the fact that people can now become POP certified instructors – ah, it’s just amazing and blows my mind every single day! EYE: Is there one quote – either your own or someone else’s – that represents who are you and what you’re about? CASSEY: I love the quote “difficult roads lead to beautiful destinations.” This goes for everything in life. When you want something, it may not always be easy, but it will be worth it when you get there. And it’s so much more satisfying when you know it was a difficult path, but you got through it anyways. EYE: Is there one exercise that Cassey Ho DOESN’T like to do? CASSEY: I really don’t like running on treadmills. I’d much rather do cardio using my own body weight and without using machines. CASSEY: Connecting more and more POPsters together offline! EYE: Thanks, Cassey! As a lifetime member of 24 Hour Fitness, I WILL become a POPster. Congratulations, again!